Organic apricot jams with organic sugar, tasty and healthy sweets, excellent as a spread and cake supplement. Apricots contain large amounts of potassium and sodium that are suitable for lowering blood pressure and are excellent in the prevention of cardiovascular diseases. The high content of beta-carotene and lycopene has a very beneficial effect on heart health. Vitamin A with which apricot abounds is a powerful antioxidant that protects the cells and tissue from damage caused by free radicals that result from the exposure of the organism to various harmful effects. Apricots are also an excellent source of plant fibers, which favorably affect the digestive system. 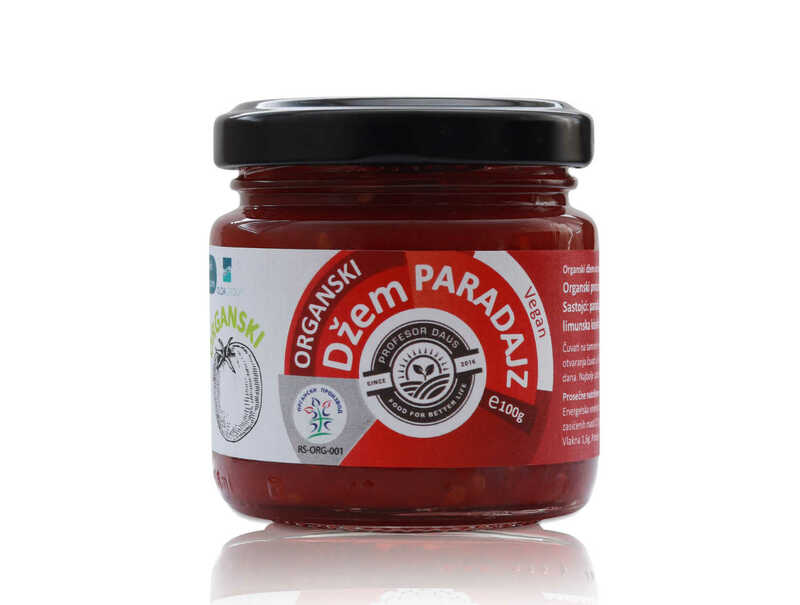 Organic tomato jams with the organic sugar, tasty and healthy sweets, excellent as a spread for breakfast, perfectly complies with cheeses, wines and various types of meat; simply invites you to find the most beautiful combination for yourself. The combination of harmonious flavors is able to satisfy even the most demanding gourmets. Organic tomato jams with the addition of fragrant lavender, tasty and healthy sweets, excellent as a bowl for breakfast, perfectly complies with cheeses, wines and various types of meat; simply invites you to find the most beautiful combination for yourself. The combination of harmonious tastes is able to satisfy even the most demanding gourmets. Organic raspberry jam made with organic sugar, a tasty and healthy sweet, great as a spread and cake supplement. The fruit of raspberry has a very antioxidant and anti-cancer effect. Contains proteins, dietary fiber, vitamin C, B complex, vitamins E and K; in small quantities contains almost all minerals. By consuming raspberries we provide the body with energy, proper functioning of the nervous system and maintenance of healthy tissue, in the first place of blood vessels. Raspberry is useful for blood, improving appetite in children, suppressing nausea and vomiting. Due to the low content of carbohydrates, raspberries are safe in a reasonable amount for the diet of diabetics, which can not be said for any other fruit. Our raspberry jam is handmade using a traditional home style recipe. We select premium raspberries to create delicious jam with authentic true taste. 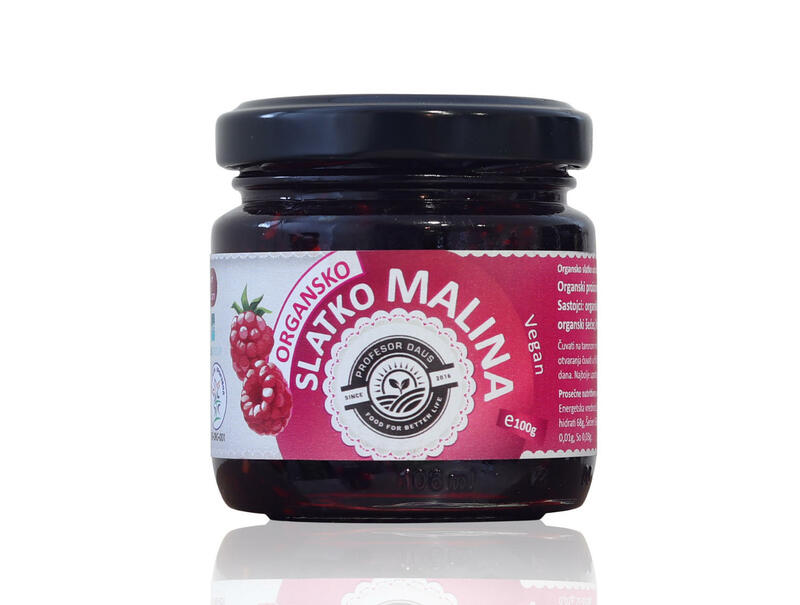 Slatko from the organic raspberries with organic sugar, a tasty and healthy sweet, from whole fruit in thick syrup. A typical Serbian specialty. Traditionally, it serves to guests as a gesture of hospitality, along with a glass of water, as an expression of affection and kindness. Slatko is used as a topping for ice cream and waffle shortcakes, and as a filling in pancakes. The fruit of raspberry has a very antioxidant and anti-cancer effect. Contains proteins, dietary fiber, vitamin C, B complex, vitamins E and K; in small quantities contains almost all minerals. By consuming raspberries we provide the body with energy, proper functioning of the nervous system and maintenance of healthy tissue, in the first place of blood vessels. Raspberry is useful for blood, improving appetite in children, suppressing nausea and vomiting. Due to the low content of carbohydrates, raspberries are safe in a reasonable amount for diabetics, which can not be said for any other fruit. Our raspberry Slatko is handmade using a traditional home style recipe. We select premium raspberries to create delicious sweet Slatko with authentic true taste. Slatko from the organic wild blueberries with organic sugar, a tasty and healthy sweet, from whole fruit in thick syrup. A typical Serbian specialty. Traditionally, it serves to guests as a gesture of hospitality, along with a glass of water, as an expression of affection and kindness. Slatko is used as a topping for ice cream and waffle shortcakes, and as a filling in pancakes. Our wild blueberry Slatko is handmade using a traditional home style recipe. We select premium raspberries to create delicious sweet Slatko with authentic true taste. Slatko from organic wild strawberry with organic sugar, a tasty and healthy sweet, from whole fruit in thick syrup. A typical Serbian specialty. Traditionally, it serves the guests as a gesture of hospitality, along with a glass of water, as an expression of affection and kindness. Sweet is also used as a dressing for cakes and ice creams, and as a spread of pancakes. Due to the presence of anthocyanins, the fruits are reddish-colored, specific, with pleasant aromas. The fruits are appreciated for their significant nutritional value. Contains sugars - mostly glucose and fructose, organic acids, minerals, pectic substances, vitamin C, vitamin B complex, folic acid. Because of its composition, the forest strawberry belongs to medicinal plants. Our wild strawberry Slatko is handmade using a traditional home style recipe. We select premium raspberries to create delicious sweet Slatko with authentic true taste. 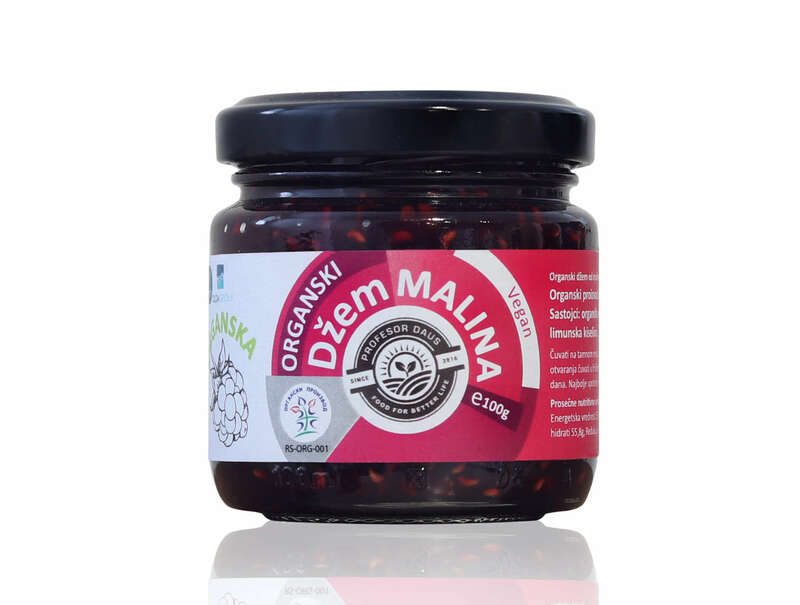 Organic plum jam made with organic sugar, a tasty and healthy sweet, great as a spread and cake supplement. Plums have the highest beta-carotene (provitamin A), vitamin C, vitamin E, folic acid, niacin and vitamin B6, and plenty of minerals: primarily potassium, then phosphorus, calcium, magnesium, sodium, iron and copper. Plum also contains soluble dietary fiber (pectin) that works favorably in reducing blood cholesterol. Plums are classified into alkaline fruit rich in potassium, which is necessary for the maintenance of acid-base balance. Due to the content of vitamin B complex, the plum is an exceptional stimulant for the exchange of carbohydrates in the body. It helps with mental disorders and difficulties with concentration, strengthens the heart and immunity, regulates digestion, cleanses the body and removes harmful substances from it, and stimulates the work of the liver and improves appetite. The laxative action of the plum has a special advantage because, due to insufficient physical activity and diet of a modern man, the activity of the intestine is reduced, especially in the elderly. Our plum jam is handmade using a traditional home style recipe. We select premium plum to create delicious jam with authentic true taste. 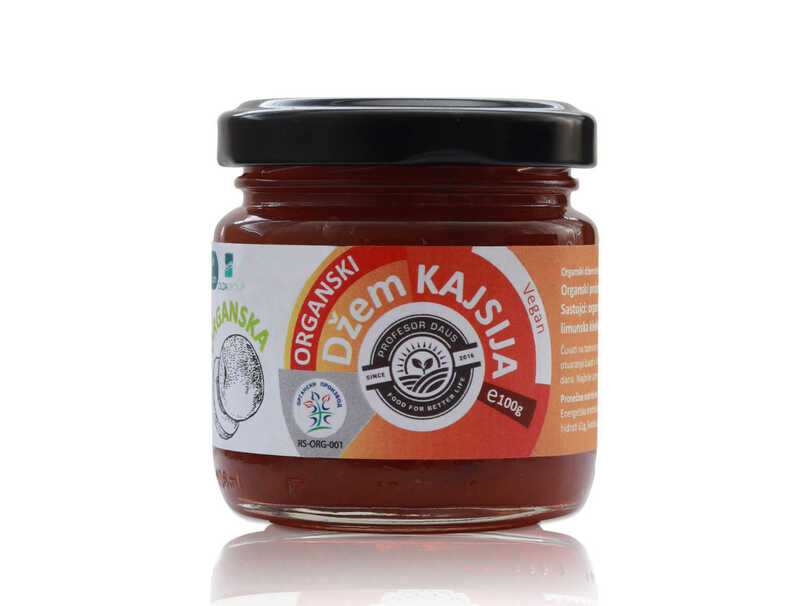 Organic rosehip jam made with organic sugar, tasty and healthy sweets, great as a spread and cake supplement. Rosehip is a fruit of wild rose that contains a lot of vitamin C, which is 400-600 mg%. In addition to vitamin C, it contains a substantial amount of carotene (provitaminin A) of 18% mg, pectin 3.7 citric and malic acid, tannins and others. From mineral ingredients, it has a lot of iron. Rosehip stimulates immunity, cleanses the kidneys, affects the better circulation and the removal of toxins from the blood. Our rosehip jam is handmade using a traditional home style recipe. We select premium rosehips to create delicious jam with authentic true taste. Slatko from organic wild blackberry with organic sugar, a tasty and healthy sweet, from whole fruit in thick syrup. A typical Serbian specialty. Traditionally, it serves the guests as a gesture of hospitality, along with a glass of water, as an expression of affection and kindness. Sweet is also used as a dressing for cakes and ice creams, and as a spread of pancakes. The fruit of blackberry is rich in various nutrients such as sugar, acid, mineral salts, iron, phosphorus, calcium, aromatic substances and other elements. The fruit of the blackberry contains essential oils, tannin and pectin, amber, apple, oxalic, lactic, salicin acid and vitamin C in a higher quantity. It's very rich in fiber. Blackberry fruit has a potent antioxidant effect and reduces the production of LDL cholesterol. Blackberry is recommended as an excellent therapeutic agent for people with low immunity and children, and has long been used to strengthen the body. Our wild blackberry Slatko is handmade using a traditional home style recipe. We select premium raspberries to create delicious sweet Slatko with authentic true taste.